It's that time of year again when we try and finalize plans for winter projects. Currently there are 30 trees on the golf course that are marked with orange ribbon which will be removed per the Tree Management Plan (TMP). With the following pictures I will provide some details as to why these trees are marked for removal, but you can at any time review the TMP and see all future projects including an explanation of the Club's practices and philosophies with respect to the management of its trees. Click HERE to see the TMP. Near the 4th tee there is a small fir tree overtopping one of the native oak trees. As clearly stated in the TMP, any tree competing with one of the native oak trees should be removed as long as removing that tree doesn't also remove a safety barrier to members and guests. Funny thing about this tree, 6 years ago we removed 20 large firs in this area in order to improve turf conditions on the 3rd green. The project was a huge success and was also one of our first attempts to release some of our threatened oak trees. Some skeptics thought we couldn't save these oak trees because they were too far gone. I decided to leave the little fir tree because at that time it was not overtopping the oak tree. In just 6 years that little fir tree has doubled in size and is now overtopping the oak tree which is clearly thriving following that initial release project. This is a great example of just how invasive the Douglas fir tree is, and also a great example of the continued success we've seen from the Club's current tree management strategies. The oak trees can be rescued and removing the competing fir trees or "oak release" does work. 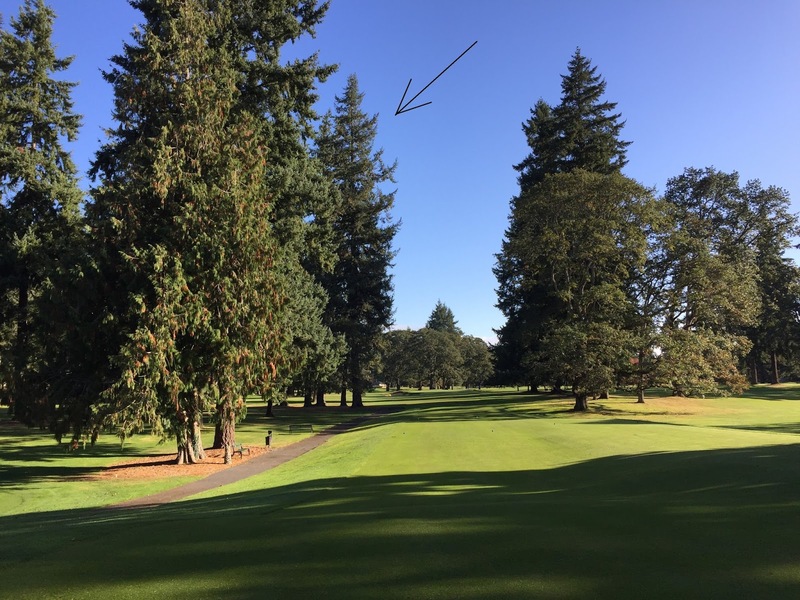 This little fir tree is right next to the forward tee on number 4 and it's one that was planted as part of the restoration project which followed the installation of the sewer pipeline in 2010. Along with this tree there are several others that were planted as part of that project which are marked for removal. Why are we removing trees that were planted just 7 years ago? Simply put these trees were planted in an attempt to screen certain areas that were exposed by the sewer project so they were planted very close together. Now many of these trees have grown to the point where they are crowding each other so they need to be thinned out. 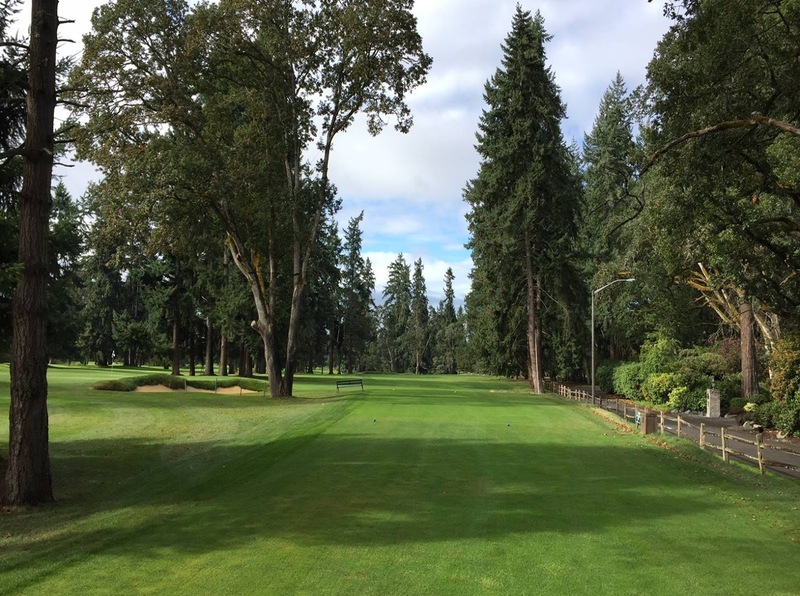 Also, the growth rate of these fir trees is very predictable and therefore it is quite simple to know which trees cannot be allowed to reach maturity when they will inevitably cause shade issues for fine turf or native oak trees. It is much simpler to remove these trees when they are small than to wait for them to get so large that removing them would be a costly ordeal. Near the restroom on #6 there is a large fir marked for removal. This cart path will be removed this winter and we're going to need all the sunlight we can get to grow grass in here, but also you can see that this fir is in the middle of an oak grove. This is a classic example of overtopping. All of the oak trees in this area are being shaded by this fir tree and those trees are clearly under a lot of stress. This next picture shows just how much stress the oak trees are under. You can see all the trees are growing away from the fir tree looking for sunlight and in the forefront you can see that one tree has given up and died. If you go to look at this tree up close you'll see that it has a metal tag on it. This metal tag is part of the sunlight study we conducted in 2007 when we first embarked on removing trees in order to improve putting green conditions. The 6th green was one of our worst greens and for the study every tree that cast a shadow on that green was marked with a tag and entered into a computer model. So in other words this tree is not only killing oak trees, it is also shading the 6th green. Here we're looking at the tee shot from the 11th tee. The fir trees just off the tee and in the middle of this picture will be replaced with maple trees taken from the right side of the 8th hole. The fir trees are growing into the hole's line of desire limiting players options not to mention they're overtopping several oak trees. 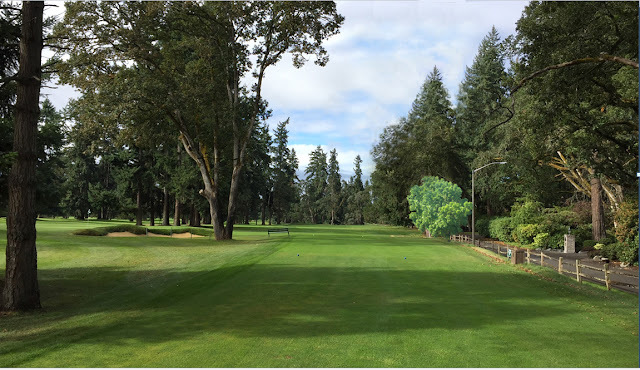 The new planting will help prevent errant shots from entering the roadway while removing the firs will allow players to start their tee shots right of center if they want to play a draw. Giving players the ability to start their shots right of center will also reduce the number of errant shots landing near the 16th green which has always been a safety concern. I'm not the best at photoshop but this next picture kind of shows what it will look like. Behind #14 green there are 5 fir trees and one ash tree marked for removal. The ash tree has simply outgrown its space and will be replaced with something more appropriate. The fir trees have grown to where they now shade the green for too many hours in the day and since they aren't getting any smaller, it's time they go. Here's a picture of the 14th green taken just the other day at 1 o'clock in the afternoon. When the sun is at the highest point of the day and the putting green is covered in shade, it's pretty obvious there's a problem. Those of you who play golf during the cooler part of the season know all too well that the 14th green suffers from shade. It is always the last green to thaw out after a cold spell. Lastly, lets talk about the 3 trees left of the 17th which are marked for removal. Here's how the tee shot looks from the championship tee. It's getting narrower and narrower each year and it's getting to the point where the holes "shot value" is greatly diminished. What is "shot value"? 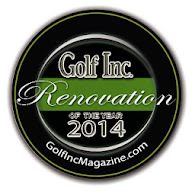 It's a measure used to quantify the quality of a golf hole or in this case the quality of one golf shot. Golf shots that have high "shot value" are those that make the player think. When a hole becomes narrow as in this case on #17, the players options become limited to the choice of just hitting a straight shot. There is no room to hit any other type of shot. When your choices are limited and very little thought is required, you end up with a shot that has poor "shot value". On top of all that these trees on 17 are strangling some of our largest native oak trees. Here's a look at these trees from a different angle. It's pretty obvious that the fir trees are forcing the oak trees to grow away from them. The oak trees are trying to survive but they will eventually loose the battle since these fir trees are young and growing much faster than the oak trees. That concludes my review of this years TMP projects. Please don't hesitate to contact me if you still have questions or concerns.